SOUTHAMPTON, PA, USA, July 6, 2016 – Environmental Tectonics Corporation’s (OTC Pink: ETCC) (“ETC” or the “Company”) Simulation business unit (“ETC Simulation”), located in Orlando, Fla., has been contracted to deliver an Advanced Disaster Management Simulator (“ADMS”) training system to U.S. Army installation Fort McCoy (Fort McCoy), located in Wisconsin, USA. The ADMS system was procured through the Defense Logistics Agency (DLA) Fire & Emergency Services Equipment (F&ESE) Tailored Logistic Support Program (TVLSP). The ADMS-Command system will be located at the Fort McCoy Fire Department where it will be used to train approximately six hundred (600) military firefighters and two hundred (200) civilian firefighters annually. Trainees will include firefighters from the Department of Defense, U.S. Army, Army National Guard, Air National Guard, and surrounding civilian fire departments. The primary objective will be Incident Command and joint training exercises for firefighting, HAZMAT and CBRNE incidents, mass casualty events, acts of terrorism and natural disaster preparedness. As a Total Force Training Center, Fort McCoy’s primary responsibility is to support the training and readiness of military personnel and units of all branches and components of America’s armed forces. Fort McCoy is a Secondary Mobilization Force Generation Installation prepared to support contingency operations as ordered. 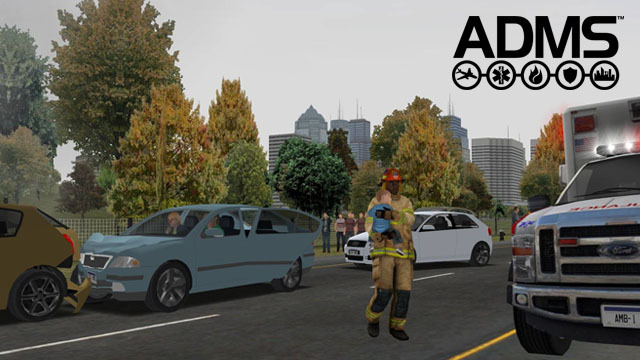 ADMS is a virtual reality simulation training platform designed to prepare incident commanders, command teams and emergency operations staff worldwide for any natural or manmade disasters. With its’ signature True Simulation technology that blends artificial intelligence, physics-based simulation and photo-realistic graphics, ADMS training provides an economical, safe and environmentally friendly platform for first responders and emergency managers. ADMS™is a high-fidelity Virtual Reality Simulation Training Platform that comprises multiple products including Incident Command training from technical to strategic level (ADMS-Command), emergency response and force protection specific to a military environment (ADMS-Airbase), firefighting techniques and tactics (ADMS-Fire), driver training and vehicle operation (ADMS-ARFF and ADMS-Drive) and multiple level police coordination for crowd management and riot control (ADMS-Control). ETC’s signature True Simulation Technology blends physics-based simulation, embedded artificial intelligence, accurate animations, photo-realistic graphics, ambient sounds, vehicle controls, and motion platforms to totally immerse trainees in the exercise. ADMS enables first responders and emergency managers to prepare at all levels of response in a safe, economical and environmentally-conscious way.